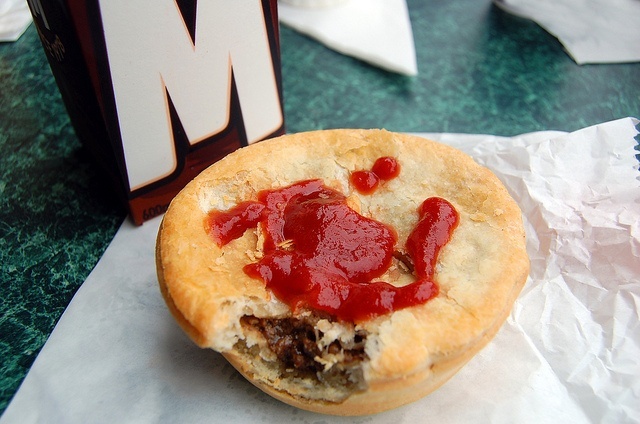 Loved by everyone from tradies to Hollywood celebrities, the Aussie meat pie has been described by current Minister for Foreign Affairs Bob Carr as 'Australia's national dish'. Though the budget frozen pies you get at the supermarket and some of the dodgier ones you find at sporting events may contain some questionable ingredients, and be notoriously bad for your health, in recent years, our expectations for this humble food-on-the-go have risen significantly. There are now, thankfully, plenty of pie-makers around town who produce gourmet versions of the classic pie, using fresh ingredients, quality cuts of meat and fine, flaky pastry. Best of all, there is plenty of imagination going into creating pies these days. There will always be a place for the traditional varieties, such as pepper steak, shepherd's pie, and meat and pea, but at the same time it is heart-warming to see so much originality going into producing delicious new variations. If I sound overly enthusiastic about a food that many Australians take for granted, put that down to living overseas for a long stretch of time. Being away from home, you come to realise what's really important in life. And what's really important is pies. Here are my picks for some of the best pies in Brisbane. What are yours? The Muhammad Ali of pies, this bad boy certainly packs a punch. Make sure you work up an appetite before going toe-to-toe with this flavour-filled meal, or in fact any of the other tempting, creative pies on offer at Piefection. The greatest? We'll leave that for you to decide. Basically, everything served up at the Deli Cafe is great, and the pies are no exception. As well as the lamb pie, the beef and red wine and chicken and veggies options are also superb. The meal-sized pies are chock full of fresh ingredients and perfectly tender chunks of meat. The duck pie at JP is also off the hook, but since it's only available in the winter months, let's let its avian cousin take centre stage for a while. You'll probably need a fork to eat this one, as it's filled to bursting point with juicy chicken pieces, mushrooms, creamy sauce and other goodies. Banneton's pie pastry is so good that you could stuff it with almost anything (sawdust, killer bees, anything) and it would taste OK, but as a bonus they have a bunch of original fillings like the Mexican, which contains a tangy chilli con carne meat and kidney bean concoction that works a treat in pie form. The occasional curry pie is an important part of a balanced pie diet. Every now and then a plain meat pie won't cut it, only curry will do, and Uncle Bob's have some of the best in town. Quality beef, quality pastry, and a zingy curry flavour make for a delightfully tasty package. Once you've tried the curry pie, you'll probably want to come back to sample some of the other varieties at this award-winning bakery as well.